The stories of little beach bums: KJ & KA: Family Weekend! 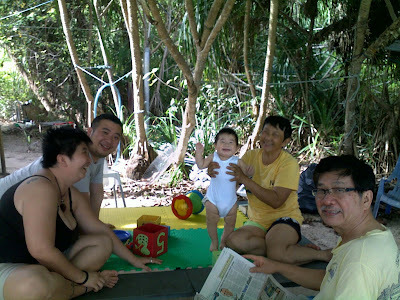 Over the last weekend, Kong Kong & Po Po, Jiu Jiu, Chin Che, Wei Khang ge ge and Uncle Ubi Plant all came and visited me. I was jumping in joy to see. Some people say I am perpetually happy but I guess I get more happy when I see them. Wei Khang Ge Ge has moved on to work for Jiu Jiu now. He is a beach boy moving on to be a city boy! I still like to bully him hehehe! 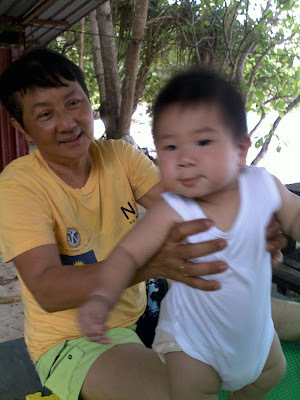 I miss playing with Po Po, she loves teaching me to dance and I enjoy dancing with her! And Kong Kong and Jiu Jiu took me to the sea, it was cold (check out my face) but I enjoyed it nevertheless. I love my new toys! 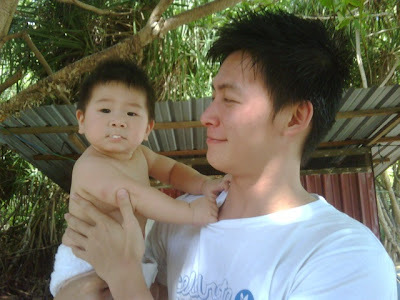 We ended the day by having a nice swim with papa (actually everyday) Hehe! I really enjoyed my weekend with them around, VISIT ME sooooon ok? Your little one is so chubby and cutie! ur also so fair against ur papa...hehe. This is Hao Re Gogo's mummy writing - I am so tempted to pay you a visit. Kai-Jin mummy, can you please tell me what's the easier way to get to Perhentian and how many hours of travelling involved? If I can work out the logistic, would surely visit Kai-Jin during my 2nd trimester, great break for the whole family!